California Penal Code makes entering a farm with the purpose of interfering or injuring it punishable by up $1000 and/or 6 months in a county jail. Posting No Trespassing signs improves the ability of law enforcement to arrest prosecute trespassers. Property fraud and drug operations are other forms of trespass of concern to rural property owners. There are no California laws which allow someone to enter a farm and “rescue” livestock or poultry. Activists thinking otherwise have been arrested in California. In most areas of the state, it is legal for hobbyists or commercial companies to operate drones over private property. 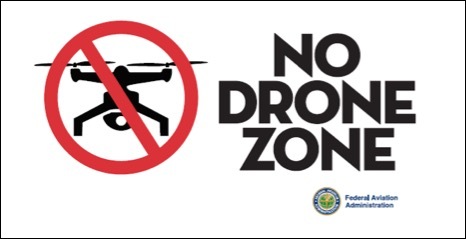 A number of federal and state restrictions exist which drone operators must comply with. Frightening livestock and viewing private areas on a property is illegal. In all cases of trespass, either by persons or drones, the first action is to call 911 asking for response from the police or sheriff. Damaging a drone invites legal repercussions. California farmers lose tens of millions of dollars every year from theft or vandalism. Aside from theft, however, there are other potential liabilities associated with trespass on farms. Confrontation – Threatening or assaulting a trespasser can potentially result in frustrating and expensive legal entanglements. 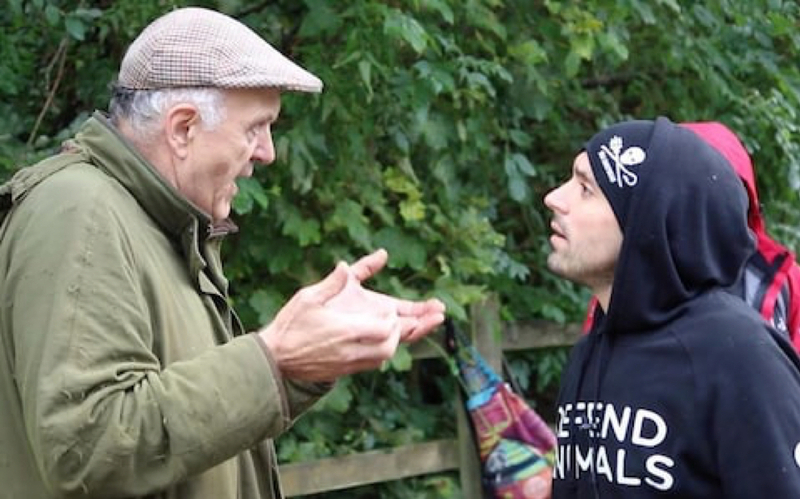 In particular, animal liberation activists will seek to provoke an aggressive response from farmers to capture recordings that are later used to attract new members and donations. While asking trespassers to leave is appropriate, it is best to allow law enforcement to intervene on your behalf. Condemned Product – Depending on the nature of the trespass, a potential exists that a company would be forced to dispose of product because the security of the food supply chain had been violated. Following a recent trespass involving “rescue” of cage-free laying hens, a San Joaquin farm had destroyed $361,000 worth of poultry because of biosecurity, food safety concerns. After pleading guilty to misdemeanor trespass, two activists now face restitution hearings for the value of the lost revenue. Drug Laboratories – Relative to producer and employee personal safety, the most hazardous security issue are clandestine methamphetamine laboratories or illegal marijuana grows. Labs can be set up in employee housing, barns, out-buildings or even as “rolling labs” in the back of vans parked in remote areas on a farm. Cleanup costs can range $2,000 to $150,000 and are frequently borne by the landowner. If there is evidence of such an operation on your property contact law enforcement immediately. Under NO circumstance should you approach a laboratory, which may be explosive, or suspects, who may be armed. Property Fraud – A fraud seen with increasing frequency in California is to occupy vacant properties owned by someone else, i.e. “squatting.” Con-artists may change door locks, start mail and utility service and even provide property improvements. One variation of the crime is to “lease” the property unsuspecting renters, collecting a down-payment and rent. When confronted by authorities the criminals may present foraged leases or ownership documents, leading to costly and prolonged evection proceedings. In reality, these drifters are seeking free housing or, more commonly, a cash payment from the landowner to leave the property. Injury Liability – Although rare, there have been cases where an injured trespasser has sued a landowner for negligence in allowing a hazard that could have been reasonably anticipated to cause harm. No Trespassing and other warning signage provide important protection to claims of this sort. Similarly, as appealing as the notion might sound, it is illegal to create a hazardous trap for potential trespassers. Besides posting No Trespassing signs, the most effective action a producer can take to limit the farm’s liability is to train family and employees to monitor the premises for evidence of trespass and contact law enforcement immediately. Why advocate for prosecution of trespass? There will be instances when landowners will request that the County Sheriff and District Attorney aggressively pursue trespass violations. The farmer’s goal may be to discourage future trespass committed for the purpose of convenience, hunting, dumping, vandalism, theft or activist activity. One example of such deterrence occurred during a recent demonstration at a Petaluma poultry plant where activists “rescued” (removed) live birds. Local law enforcement reported that many of the forty activists arrested for misdemeanor trespass were surprised and dismayed to find themselves photographed and fingerprinted. In addition, such activists would have to disclose they had a criminal arrest record during a job application process. • Misdemeanor Trespass – punishable by up $1000 and/or 6 months in a county jail. • Aggravated Trespass (involving threats) – punishable by up $2000 and/or 3 years. The California Rural Crime Prevention Task Force (CRCPTF) has created a summary of California’s trespass laws of interest to agriculture. There are a number of actions producers can take to support law enforcement officers responding to a trespass complaint and help ensure that the District Attorney’s office can effectively prosecute the case to the fullest extent. 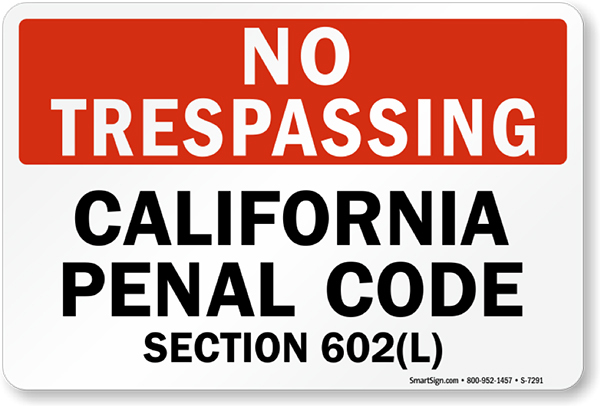 Signage – California’s Penal Code section 602(K) makes it a misdemeanor to enter a property “with the intention of interfering with, obstructing, or injuring any lawful business or occupation”. In addition, Penal Code section 602(h) also makes it a misdemeanor to enter a livestock farm without permission. For district attorneys to utilize section 602(h) however it requires that “No trespass” signs are posted at least 3 per mile and at all roads or trails entering the property. The signs must be at least one foot square with letters at least two inches high. Sign costs can range from $8 to $40, depending on size and materials used. Signs may be available at reduced cost to Farm Bureau members. Signage may help mitigate the landowner liability in the event a trespasser is injured. Presence of Law Enforcement – It is always easier to prosecute a trespass case if it occurs in the presence of a law enforcement officer. For both legal and personal safety reasons, the very first action a farmer should take when he becomes aware of a trespasser is to call 911. Tell the 911 dispatcher you are concerned about your own safety, as well as the safety of your employees, animals, and property and ask for an immediate police or sheriff response. Record a Request to Leave – Penal Code section 602(I) makes it a misdemeanor if a trespasser enters a cultivated property and refuses to exit a property when asked. A cell phone video recording of a trespasser being asked to immediately leave and not doing so is good evidence supporting a deputy sheriff in making an arrest and the district attorney during prosecution of the case. Pictures of vehicles and license plates used by trespassers or drone operators can also be useful to law enforcement. Dairy Contact Person – In order to complete a useful incident report, a responding patrol officer will always appreciate a calm, knowledgeable point-of-contact for the dairy. The dairy’s representative can provide the facility’s physical address and contact information as well as a description of the trespass, including the areas of the facility that were encroached upon. Any previous history with the trespasser(s) and where No Trespassing signage is posted will be useful. Any evidence the producer has collected can be provided. This can include pictures of trespasser’s vehicles and license plates and video recording of the trespass and someone asking them to leave. 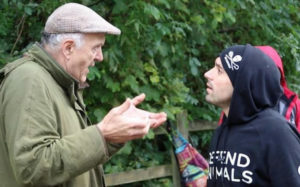 Familiarity with Applicable Law – Activist trespassers may try to confuse responding law enforcement and prolong the incident with claims or documents maintaining that the State Penal Code Section 597e allows them to remove animals in the context of an “open rescue.” In fact, this section clearly states that people may furnish food and water to confined domestic animals deprived of such, but that those animals must remain confined. In addition misappropriation (theft) of animals is not covered under California’s “necessity defense” which applies only to humans. Lastly, Penal Code Section 459 states, “Every person who enters any … barn, stable, outhouse or other building … with intent to commit grand or petit larceny or any felony is guilty of burglary.” Responding law enforcement can explain to activists being arrested that their lawyers are free to make any arguments they wish during their court hearing. Clear Producer Expectations – It is essential that the producer makes his or her expectations known respectfully but firmly. Such expectations can include the removal and arrest of trespassers and follow-up on the process of the case. Collect business cards from the responding officers. Similarly, during the incident follow-up, it is useful for the producer and/or trade organization make their expectations for prosecution known to both the Sheriff and District Attorney, which are both elected officials in California. 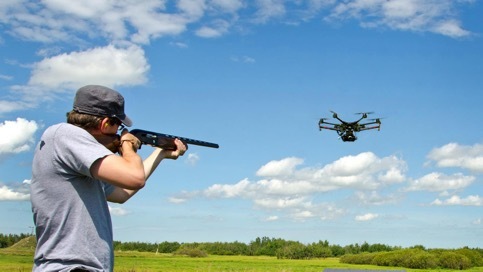 Unlike physical trespass by a person, there is relatively little protection from flights of Unmanned Aerial Vehicles (UAV’s or “drones”) over private property, including farms. This is in spite of the fact drone law is an active area in the courts. The Federal Aviation Administration (FAA) maintains that any airspace over 400 feet of elevation is regulated public airspace. Claiming a lack of authority, the agency refuses to regulate privacy issues from ground level to 400 feet. The agency does, however, have safety regulations for drone users. General Safety – Drones must yield right of way to manned aircraft. 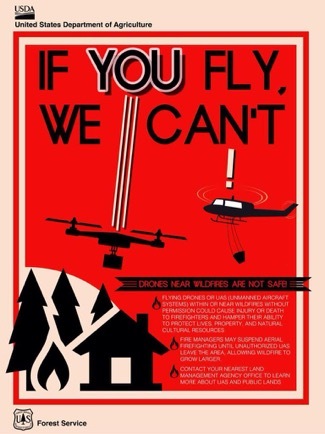 Drones may not be used in emergency response areas such as wildfires. Drones may not be flown over people or cars. Drones may not operate at night-time, meaning 30 minutes before official sunrise to 30 minutes after official sunset. Drones may not operate under a covered structure. Pilots must be able to see their drones at all times (unaided, “Visual Line-Of-Sight”). Operators determined to be flying in a “careless and reckless manner” have received between FAA fines ranging from hundreds to hundreds of thousands of dollars. Regardless of whether the drone is being controlled by a “hobbyist” for recreational purposes, or by a commercial operator charging for services, drones weighing between ½ pound and 55 pounds must be registered using Federal Drone Registry website. Registration, which is valid for three years, also provides a registration number which must be affixed to the drone. While technically penalties for flying an unregistered drone could include fines and jail time, to date enforcement has consisted of warning letters. For professionals who sell drone footage (such as a realtor, agricultural consultant or photographer) the operator must take and pass an FAA exam and receive a remote pilot certificate which is valid for two years. Remote pilots working for non-profit organizations that are collecting donations, holding conferences, paying salaries etc. meet the definition of commercial operators. Fly Lower than 400 Feet – Airspace above 400 feet is regulated and controlled by the FAA for passenger traffic. Most near misses with planes occur at greater than 400, roughly equivalent to a 13 story building. • Within five miles of an airport. • Local restrictions (i.e. Washington D.C. & Golden Gate Bridge are no-fly zones). • Temporary Flight Restriction (TFRs are declared during emergencies like wildfires). In 2014 the California legislature strengthened privacy protection with the passage of the so-called Paparazzi Law. The law prohibited the use of recording devices on people without their consent, regardless of whether or not the recorder had committed physical trespass. The law was inclusive of any sound or visual images collected when the subject had a reasonable expectation of privacy, including “private, personal, and familial activity.” Unfortunately, while activities in a family’s backyard would certainly be protected, cows in a dry-lot have no expectation of privacy. 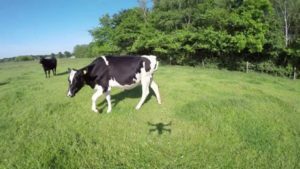 What if the drone is frightening my livestock? California Department of Fish and Wildlife regulations related to Harassment of Animals reads “…no person shall harass, herd or drive any game or nongame bird or mammal or fur-bearing mammal… harass is defined as an intentional act which disrupts an animal’s normal behavior patterns, which includes, but is not limited to, breeding, feeding or sheltering.” Additional charges could be brought based on the California Penal Code relate to Cruelty to Animals. Lastly, some counties, municipalities, state and national parks also have drone restrictions which may be relevant. In addition, some jurisdictions may have noise or nuisance ordinances which could be applicable. The FAA has confirmed that drones are aircraft, thus, technically harming a drone is a felony, potentially carrying a penalty of up to 20 years in prison. However, while there have been perhaps a dozen drone shootings in recent years, to date no one has been prosecuted in federal court for shooting down a “plane.” Never-the-less, shooting down a drone does carry legal liability. Criminal cases have been brought against drone shooters in the categories criminal mischief, malicious destruction of property or reckless discharge of a firearm. Civil cases have also been made for repair or replacement of damaged drones. In 2015 a Modesto drone operator was awarded $850 after his UAV was shot down hovering near his neighbor’s property line. More advanced drone models may cost tens of thousands of dollars. Contact local law enforcement immediately and ask that patrol officers respond to possible trespass in progress. If the drone operator is physically present on your property then all information contained in the section above, Trespass by People is applicable. 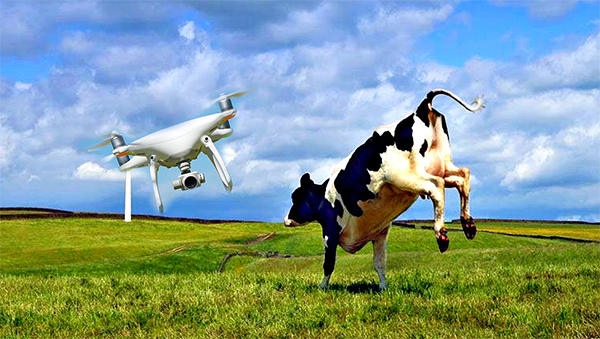 Prior to the incident, determine if the drone over your farm is flying in a restricted airspace, such as within five miles of an airport. Use FAA’s B4UFLY Mobile App. o The person operating the drone and his location. o Pictures of any vehicles and license plates the operators are using. o A drone disturbing livestock. o A drone operating under a covered structure. o A drone flying over people or cars. o Drone activity where there is an expectation of privacy (backyards, offices). When the patrol officers arrive provide them with videos, pictures and/or descriptions of any of the prohibited activities describes in the bullet points above. adjacent public roads and do not interfere with farm operations. o If the pilot claims to be a commercial operator have him provide those credentials. Damaging a drone in any way invites potential legal repercussions.